If you are new to greenhouse gardening and want to test the waters without spending too much, then the Hobby Grower Snap & Grow would be a good way to go. 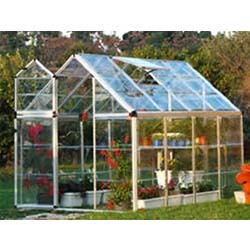 It fills the starter greenhouse niche nicely and can be a great little greenhouse for lengthening your growing season. While there is only one size option (6' x 8'), we think this is fine because if you need more space then we would definitely recommend the Rion Hobby Gardener as a better choice for anything larger. The height of the Snap & Grow is the same as the Rion Hobby Gardener at 6' 10", which is plenty tall for all but the tallest gardeners. It comes in the barn-style roof which also helps with more interior head-room than the Juliana Premium or Riga Onion. Because this is a fairly small greenhouse it is shipped in two boxes of approximately 60 pounds each. These come via common carrier (UPS), and thus you will find the two relatively small and easy-to-handle boxes on your doorstep when it arrives instead of a giant box on the back of a flatbed truck. We liked the SnapGlass panels that come with the Snap & Grow. They are nearly as clear as glass panels, but infinitely more safe and durable. We tried throwing a few rocks at the panels and they do not shatter or scratch easily, which is a drawback to using actual glass panels. The downside of the SnapGlass panels is that they are much poorer at insulating than the double-wall polycarbonate panels on the other greenhouses tested. This is definitely not the greenhouse to purchase if you want to try to winter over some plants or live in areas that commonly get snow in spring or fall.